This image of asteroid 2015 TB145, a dead comet, was generated using radar data collected by the National Science Foundation's 1,000-foot (305-meter) Arecibo Observatory in Puerto Rico. The radar image was taken on Oct. 30, 2015, and the image resolution is 25 feet (7.5 meters) per pixel. 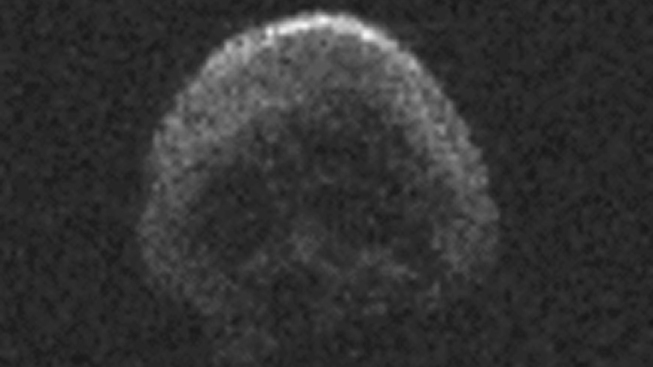 It will arrive too late for Halloween this year, but an eerie, skull-shaped asteroid that some are calling the "death comet" is coming back for another visit. On Nov. 11, asteroid 2015 TB145 will zoom past Earth at a distance of 25 million miles, NBC News reported. The first observed flyby of the ghoulish space rock occurred on Oct. 31, 2015. At that time, the space rock — NASA dubbed it the "Great Pumpkin" asteroid — flew past at a much closer distance of about 300,000 miles. The moon orbits Earth at an average distance of 239,000 miles.